There are two possible sources of this interesting and unusual name, the first being that it is a nickname for a pious person, or an occupational name for someone employed in a monastery, from the Middle English, Old French 'frere', Latin 'frater', brother, meaning a friar or a monk. 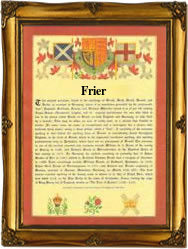 However, Freer is also a Flemish cognate of the personal name Frederick, which was introduced into England by the Normans after 1066, and is composed of the elements 'fred', peace and 'ric', power. The name Frederick was borne by a canonized 9th Century bishop, and was a hereditary name among the Hohenstaufen ruling family, hence its popularity in Central Europe. Amongst the early recordings in London is the christening of Edwarde Freer on August 1st 1574 at St. Andrew's, Enfield, and the marriage of Cecelie Freer and Henry Hyder on June 28th 1603 at Kensington. The first recorded spelling of the family name is shown to be that of Robert (le) Frere, which was dated 1196-1197, in the Pipe Rolls of Yorkshire, during the reign of King Richard 1, known as 'The Lionheart', 1189-1199. Surnames became necessary when governments introduced personal taxation. In England this was known as Poll Tax. Throughout the centuries, surnames in every country have continued to "develop" often leading to astonishing variants of the original spelling.